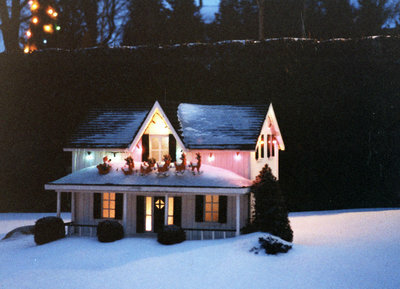 A colour photograph of a miniature house decorated for Christmas in the Miniature Village at Cullen Gardens. In this view Santa's sleigh and reindeer can be seen on the roof. Cullen Gardens and Miniature Village, December 1984, Photographer Unknown. Whitby Archives A2013_042_020.